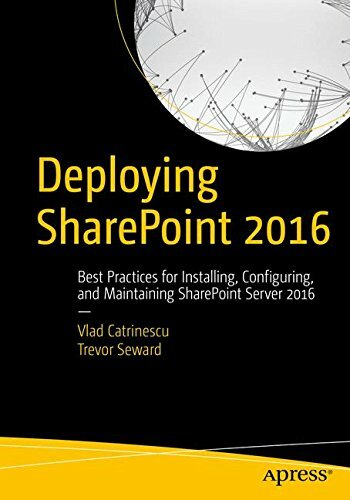 Last week I wanted to try the new SharePoint 2013 SP1 and, as I never install SharePoint without using PowerShell scripts, I tried using the awesome AutoSPInstaller to install my SharePoint. When Windows Server 201 R2 came out, the twitter sphere said that nothing changed except the Execution Policy was “RemoteSigned”. AutoSPInstaller has a Launch.bat file that makes sure the Main.ps1 launches in “ByPass” mode. However, the way AutoSPInstaller works is that it includes two other PowerShell files where the functions are stored. When those get included, the ByPass mode is not in effect anymore, and PowerShell goes back to the Machine Policy, which by default is Remote Signed. It’s a good security measure, but we need to get this fixed! File cannot be loaded. The file is not digitally signed. You cannot run this script on the current system. be set through Group Policy. 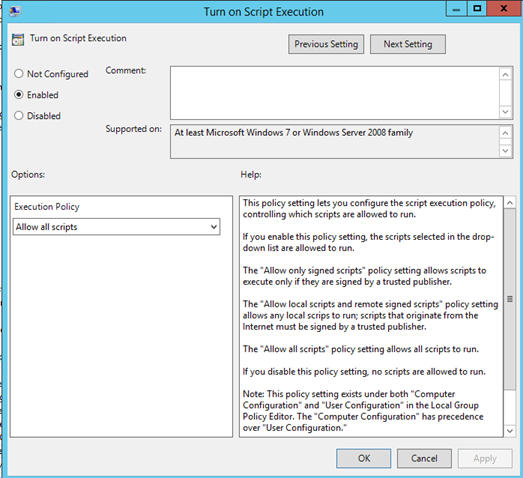 You can actually change the MachinePolcy Execution Policy without going through GPO! You need to go in the registry and edit the following key HKLM:\Software\Policies\Microsoft\Windows\PowerShell and change the ExecutionPolicy value to ByPass. 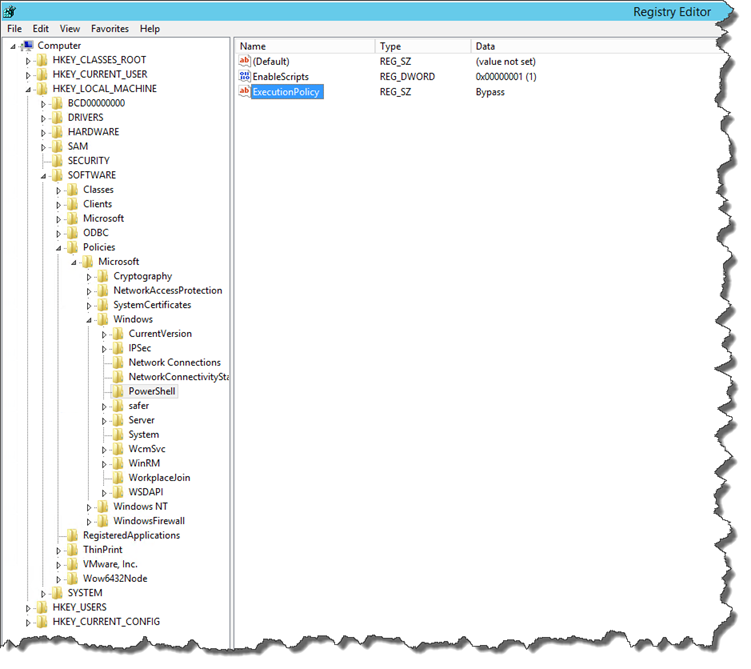 Cannot find path ‘HKLM:\Software\Policies\Microsoft\Windows\PowerShell’ because it does not exist. This is because your local group policy to allow scripts to run on the system is probably “not configured” . To configure it, run “gpedit.msc” in the metro start bar. Afterwards, the PowerShell command should work and you should be able to change your Execution Policy without any problems! Thank you for your help! Now I got RDS BPA working with that registry tweak. 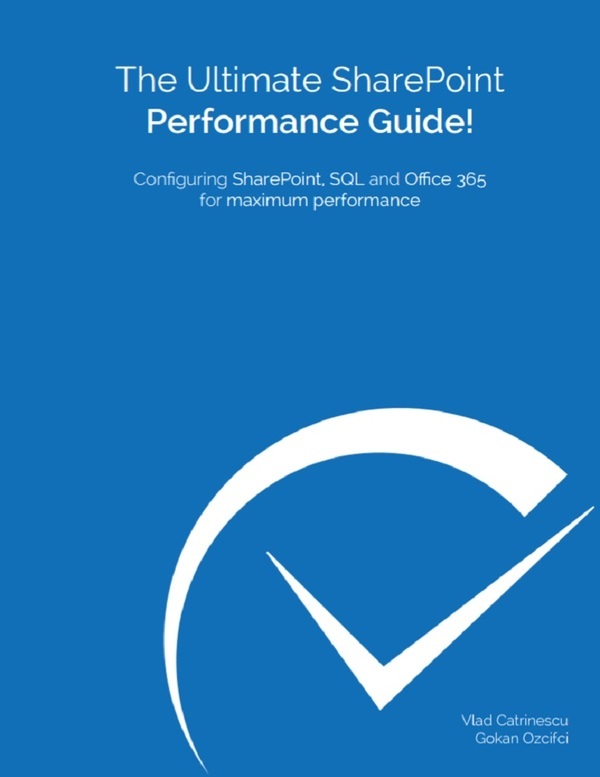 Thanks – can now run my script in Powershell 5! Did you do the gpedit part of the article? 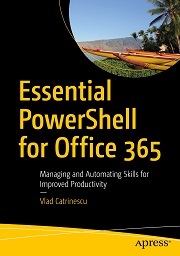 Or…you could right-click and just launch powershell with administrative privileges, make your changes to execution policy which are then saved permanently. We do this all the time and works great. As mentioned above you could also use Group Policy which to me seems less risky than running regedit or running a powershell to edit the registry which really just runs regedit. NOTE: To change the execution policy for the default (LocalMachine) scope, start Windows PowerShell with the “Run as administrator” option. After gpupdate the registry key return to unrestricted! I was getting the same error while trying to use NUGET in Visual Studio 2013. This fixed my issue as well!!!! Thanks! Worked perfectly – Thank you so much Vlad! Perfect, solved the problem I was having getting NuGet to run. I Enabled the “Turn on Script Execution” policy as instructed, but it did not create any registry keys. There is still no …\Windows\PowerShell entry on my system. I’m using windows 10 “Insider preview build”, when I tried to fix the Execution Policy through the above Directory, it didn’t work for me because, I’m using Hyper-V in UEFI-Firmware then I tried to find the Exact Directory and Successfully found it, given bellow. by right-click on windows-icon and click run then type REGEDIT and click ok, then I direct to the above given directory.